So what the �heck� do you do with yuzus if you can�t eat them? Here is where traditional Japanese cuisine comes in!The Yuzu is a commonly used fruit in Japan. They are very aromatic with a deep �citrusy� floral scent. The juice flavor is like a tart, citrus, �fusion� of lemon and lime. The fragrant peel is often minced small and added as a garnish to both soup or broiled or simmered fish. Sauces are often made from yuzu, as well as candied peel from the rind. You might recognize a �hint� of its flavor here in America from your favorite Japanese restaurant, if you have ever used soy-sauce ponzu. Now you can find yuzu being used many different culinary ways, including yuzu �essence� being infused into �high end� vodka. So, �how will you yuzu?� With a little bit of cooking skill, a little imagination and some yuzus from Pearson Ranch�the culinary sky is the limit. 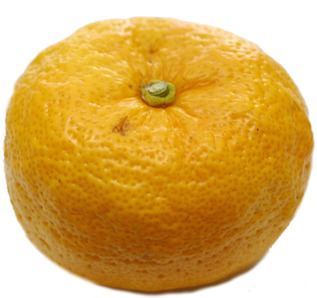 The Yuzu comes to us from East Asia, and is believed to be a hybrid of sour mandarin and a slow-growing species of citrus called; Ichang papeda. They are available Late September thru February! However, be aware that the Yuzu season can vary from year to year so please be sure to check for availability. How many pounds of Yuzus do I get in a box? Pearson Ranch sells it's Yuzus in 5 pound Quantities. For more 10 pounds or more, please call for details. Yuzus are available from when the outside peel is green, to green/yellow and finally to full yellow. Please choose from the options below.